Today 9/27/18 only, it's buy-one-get-one-free (BOGO) on almost all Lord & Taylor clearance and sale items. 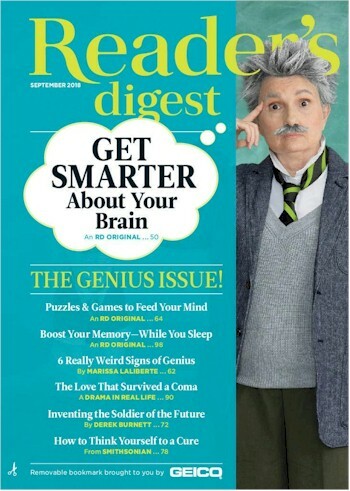 Amazon' great deal on a 1-year subscription to Reader's Digest is back! $5.00 for one year (that's 10 issues for 50 cents per issue). Planning an IKEA run soon? Print this $20 off $125 purchase in-store IKEA coupon here. Coupon good from 9/19/18 - 9/30/18 only. Amazon Prime 2-day shipping will get these items to your home by Saturday if you order them early enough today. 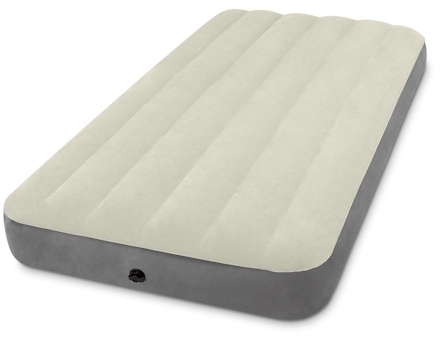 Whether you sleep in the Sukkah or just need this for extra houseguests, Amazon has got this Intex Dura Beam Standard Series Twin Airbed for only $18.97 with free Prime shipping. You're going to need a pump to blow it up, and this Intex Quick-Fill Electric Air Pump is $7.70 with free Prime shipping. 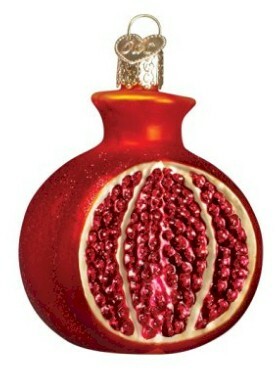 Amazon has got this glass Pomegranate Sukkah Decoration for $7.06 with free Prime shipping. 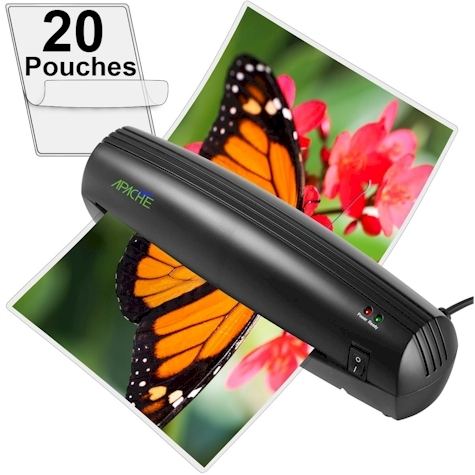 Apache AL9 9" Thermal Laminator (with 20 laminator pouches) for only $19.33 with free Prime shipping. Great for preserving home-made Sukkah decorations. 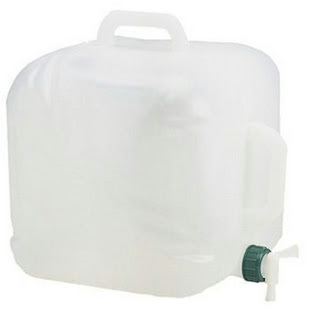 Coleman Water Jug with spigot $7.46 with free Prime shipping. We use this for hand-washing on Sukkot; eliminates the need to trek back into the house. Be sure and use a large bowl to "catch" the water when you wash your hands. 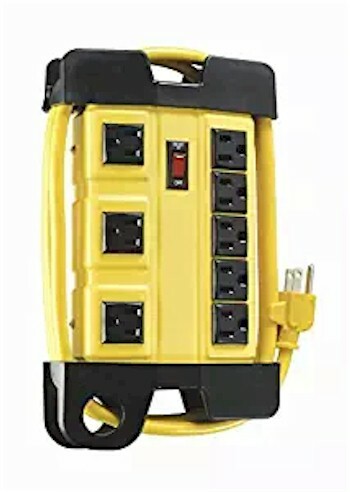 Coleman Cable 04655 8-Outlet, 6-foot heavy duty Power Strip, $20.29 with free Prime shipping. Woods 0393 16/3 Outdoor SJTW 40-foot Extension Cord, $12.19 with free Prime shipping. 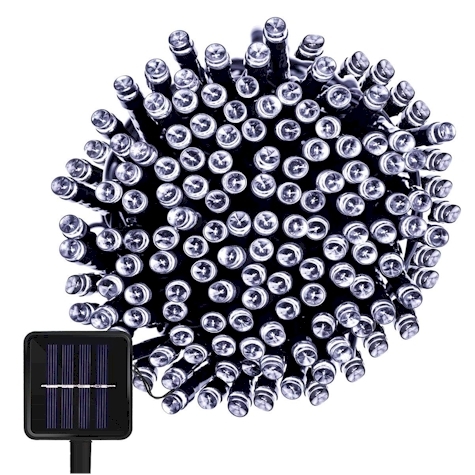 72-foot outdoor solar string light set for just $10.99 with free Prime shipping (15 cents per foot). 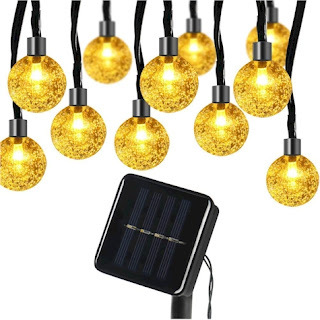 30-foot solar globe string lights, $16.99 with free Prime shipping. 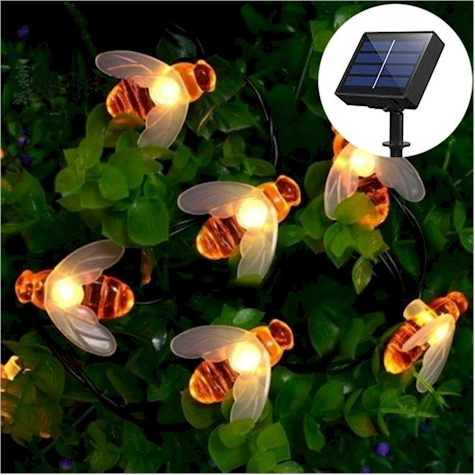 16-foot outdoor solar bee (in keeping with the honey theme) string lights for $11.98 with free Prime shipping. 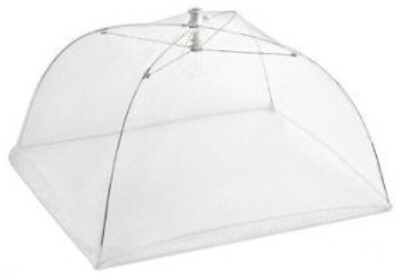 Set of four mesh food covers for $9.29 with free Prime shipping. Lots more of these are over here. Make sure you open them up before Yom Tov starts as they open the same way umbrellas do. 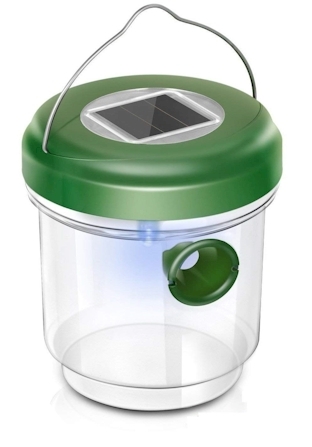 Solar Wasp Trap for $8.29 with free Prime shipping. Non-toxic and chemical-free. 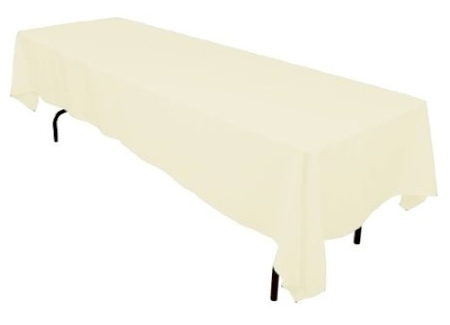 If you're shopping for long tablecloths for Sukkot, this is still one of the best classic Amazon deals around: Amazon has this 90" x 156" wrinkle- and stain-resistant tablecloth for $10.98 with free Prime shipping. 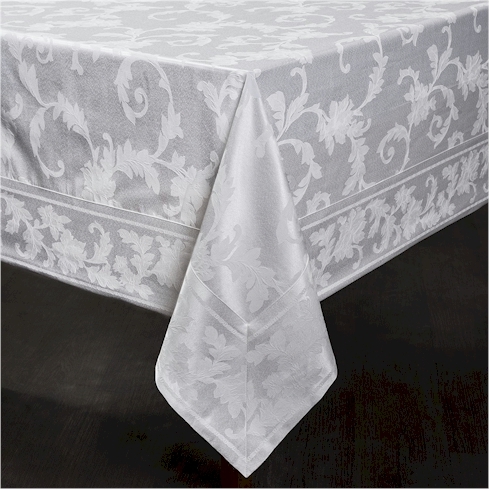 This 13-foot tablecloth will drape nicely over your 8-foot tables. These tablecloths are not going to be among your finest linens, but they are durable, wrinkle-free, wash out beautifully, and are a godsend during an 8-day holiday that is replete with huge meals and laundering restrictions. You can dress them up with a pretty runner and creative place settings. I think using one of these tablecloths is much nicer than using a fine tablecloth covered with plastic, but that's just me. Goodgram Macrame Trim beige 60" x 104" tablecloth, $15.99 with free Prime shipping. 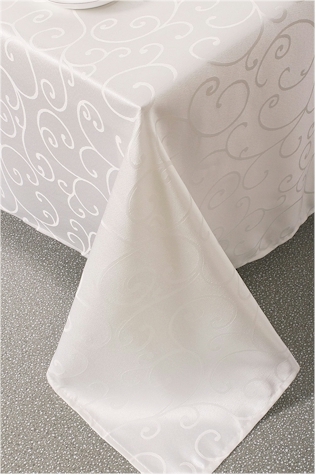 Goodgram Satin Striped stain-resistant in ivory or platinum 60" x 120" tablecloth, $8.99 with free Prime shipping. 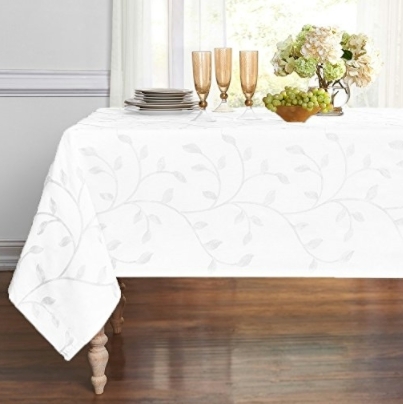 Goodgram Madison Leaf 54" x 102" tablecloth, $18.99 with free Prime shipping. I love the "Looks Like Real" plastic disposable tableware. 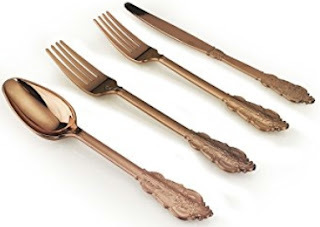 If you've got to use "fake" tableware, it really dresses up the table. It gives me the advantage of setting a lovely Yom Tov table out in the Sukkah without worrying about smashed china, and when the meal is over, everything goes in the trash. 100-count gold sparkle/glitter 9 oz. party cups for $13.99 with free Prime shipping (14 cents per cup). 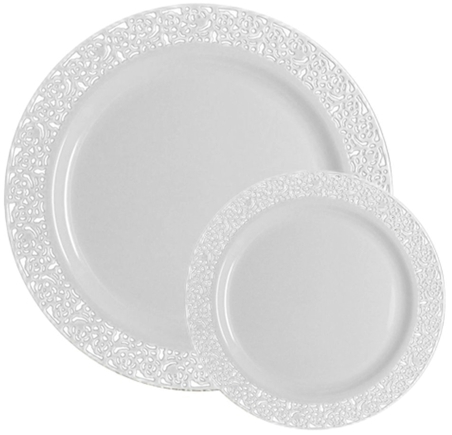 Table To Go 'I Can't Believe Its Plastic' 50-count Ivory Lace Plate Set on Amazon for $19.98 with free Prime shipping. (FYI, the ones that I ordered and received were definitely white and not ivory.) 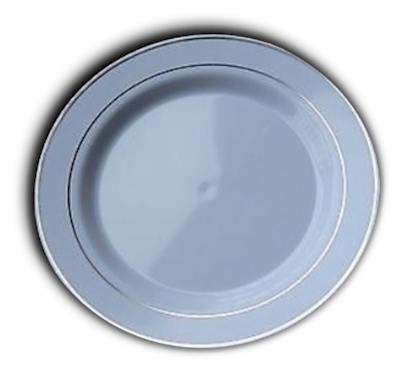 This set includes 25 - 10" dinner plates & 25 - 7.5" salad plates. 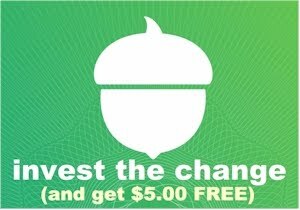 Shipping is free with either a $35 minimum order, or with just using your RedCard as your payment method (no minimum), or it's $5.99 flat-rate shipping. You can also opt for free in-store pickup. Occasions 160-piece Vintage Rose Gold Heavyweight Wedding Plastic Silverware (assorted, with double forks), $19.99 with free Prime shipping. 12 cents per piece. Occasions 160-piece Vintage Silver Heavyweight Wedding Plastic Silverware (assorted, with double forks), $16.99 with free Prime shipping. 11 cents per piece. 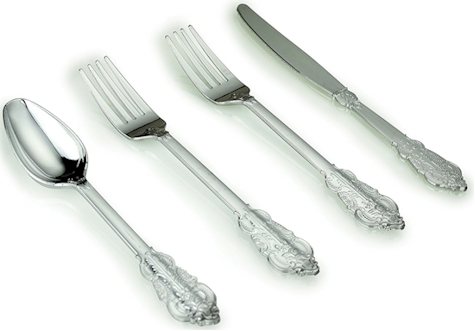 Posh Setting 160-piece Glamour Collection Heavyweight Polished Silver Plastic Silverware (assorted, with double forks), $16.99 with free Prime shipping. 11 cents per piece. 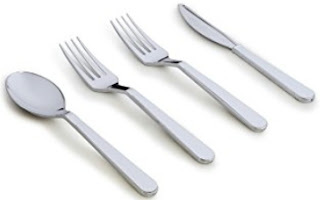 160-count Party Bargains Silver Polished Plastic Silverware for $17.58 with free Prime shipping. 11 cents per piece. 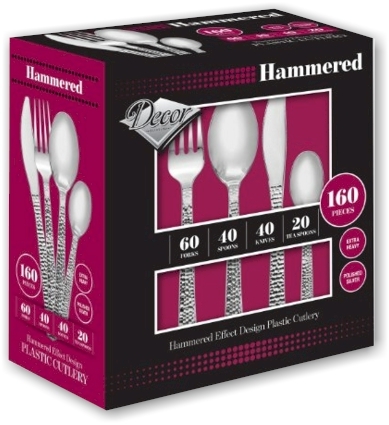 Double set of 160-piece Decor Hammered Effect Design Plastic Silverware down to $20.77 with free Prime shipping, which comes to $10.39 per set! 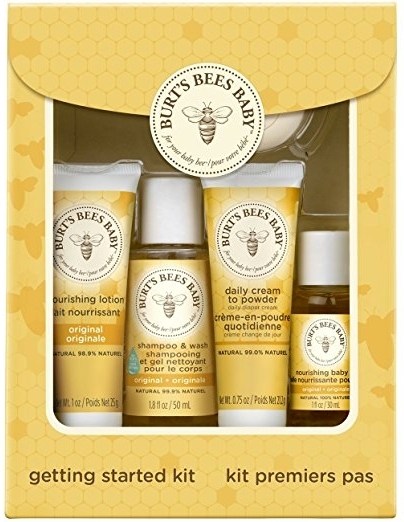 Amazon has got the Burt's Bees Baby Bee Getting Started Kit for $6.93 shipped with Subscribe & Save discounts. 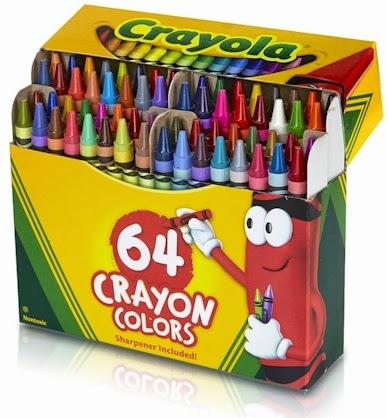 Amazon has got this 64-count box of Crayola crayons with a sharpener for $2.89 with free Prime shipping. It got 4.5 out of 5 stars over 1,196 customer reviews. Limit 5 per account. Sorry for posting this so late, but today, 9/17/18 only, get $5.00 off any Lyft ride by entering the promo code KETELONEXEMMYS in the Promotions tab. 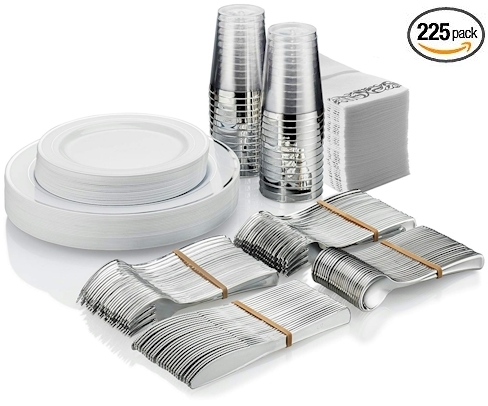 Amazon has got some great deals on "Looks Like Real" disposable tableware, perfect for Sukkot. 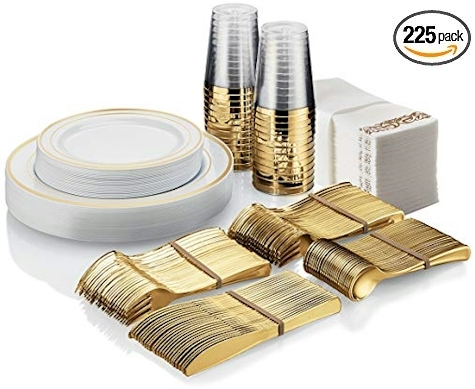 225-count complete set service for 25, including 25 dinner plates, 25 dessert plates, 25 tumblers, 50 paper guest "towels," 50 forks, 25 spoons, and 25 knives for $57.99 - 10% = $52.19 with free Prime shipping. 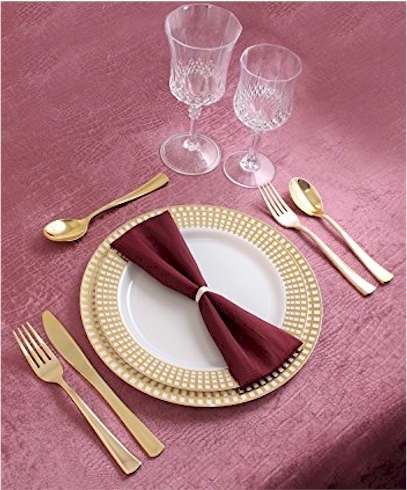 That's $2.09 for each complete place setting, an AMAZING price. 4.3 out of 5 stars over 31 customer reviews. 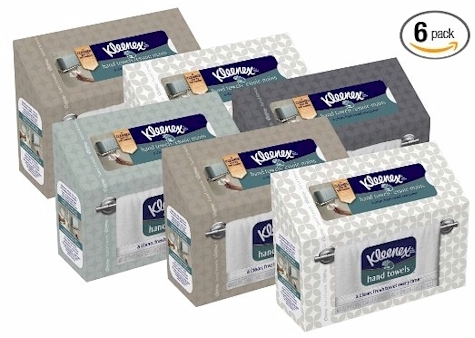 The 225-count silver version of this is here and is $49.99 - 10% = $44.99 with free Prime shipping. 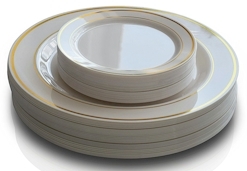 Occasions 50-count Premium Disposable Plastic plates (25 x 10.5''dinner plates and 25 x 6'' dessert plates) in white and gold for $21.90 with free Prime shipping. 4.3 out of 5 stars over 249 customer reviews. Recyclable and BPA-free. Occasions 50-count Premium Disposable Plastic plates (25 x 10.5''dinner plates and 25 x 6'' dessert plates) in white and silver for $21.90 with free Prime shipping. 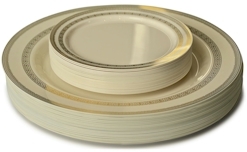 Occasions 50-count Premium Disposable Plastic plates (25 x 10.5''dinner plates and 25 x 6'' dessert plates) in ivory with a gold rim for $21.90 with free Prime shipping. 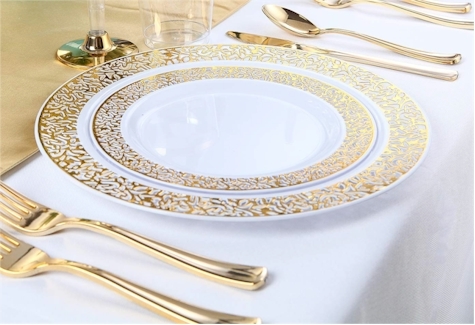 Occasions 50-count Premium Disposable Plastic plates (25 x 10.5''dinner plates and 25 x 6'' dessert plates) in lace ivory with gold for $21.90 with free Prime shipping. 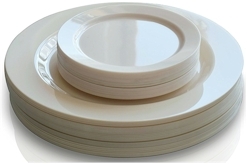 Occasions 50-count Premium Disposable Plastic plates (25 x 10.5''dinner plates and 25 x 6'' dessert plates) in plain ivory for $16.90 with free Prime shipping. 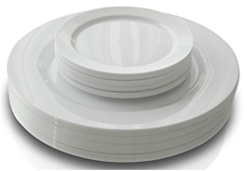 Occasions 50-count Premium Disposable Plastic plates (25 x 10.5''dinner plates and 25 x 6'' dessert plates) in plain white for $16.90 with free Prime shipping. 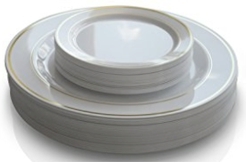 Occasions 50-count Premium Disposable Plastic plates (25 x 10.5''dinner plates and 25 x 6'' dessert plates) in white with a gold rim for $21.90 with free Prime shipping. Occasions 50-count Premium Disposable Plastic plates (25 x 10.5''dinner plates and 25 x 6'' dessert plates) in white with a silver rim for $18.99 with free Prime shipping. 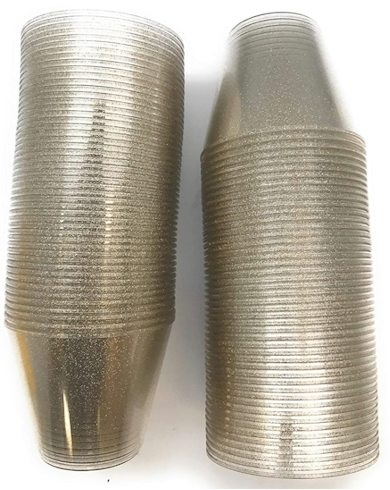 48-count Prestee 2 oz. 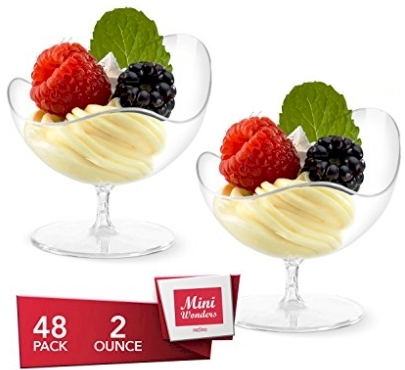 mini dessert cups (pictured above), $14.99 with free Prime shipping. 4.4 out of 5 stars over 27 customer reviews. 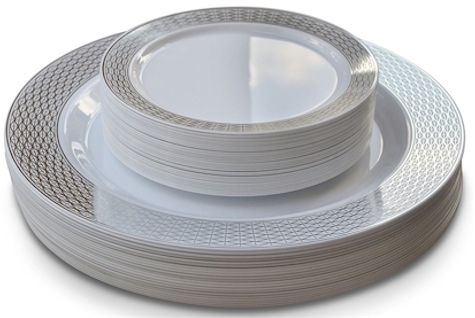 40-count Signature Collection Premium White/Gold Plastic Plates Combo Package (20-10.25" and 20-7.5") for $22.15 with free Prime shipping. 4.2 out of 5 stars over 35 customer reviews. 60-count gold lace "Looks Like Real" BPA-free disposable plates for $25.99 with free Prime shipping. This includes 30 of the 10.25" dinner plates and 30 of the 7.5" salad/appetizer plates. 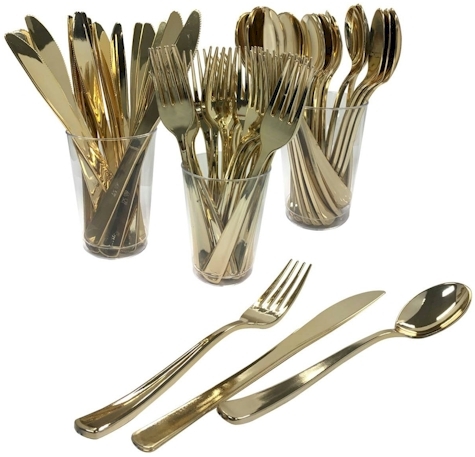 160-piece gold "Looks Like Real" disposable silverware is only $19.99 - 10% coupon = $17.99 with free Prime shipping. 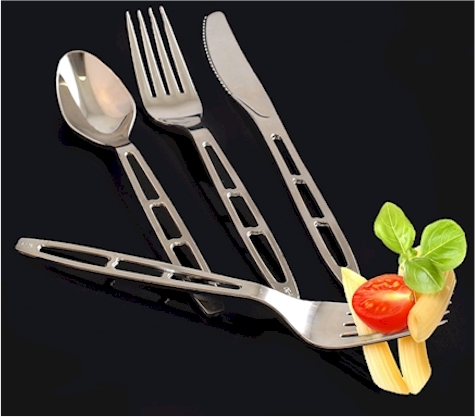 Includes double-forks in each place setting. 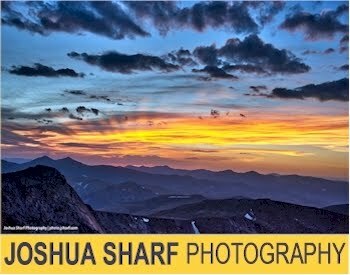 4.0 out of 5 stars over 12 customer reviews. 50-piece Table-to-Go "Looks Like Real" plastic tableware set for $19.98 with free Prime shipping. 4.0 out of 5 stars over 54 customer reviews. 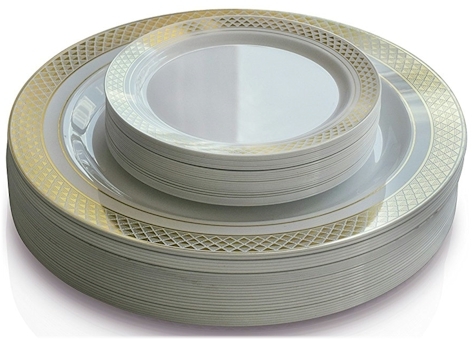 60 count "Looks-Like-Real" Reflective Premium Heavyweight Plastic Plates for $23.99 with free Prime shipping, including 30 10.25" dinner plates and 30 7.5" appetizer/dessert plates. 4.3 out of 5 stars over 112 customer reviews. 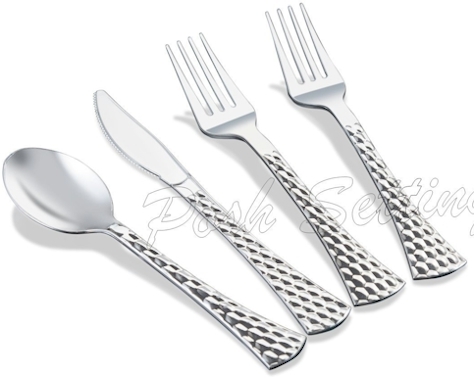 Double package of 180-count Decor Hammered Effect Design Plastic Silverware, $20.77 with free Prime shipping. 3.8 out of 5 stars over 36 customer reviews. 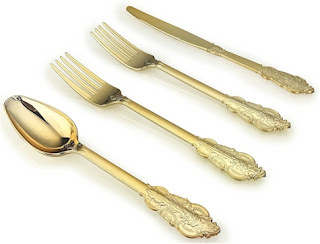 Occasions 160-piece Vintage Gold Heavyweight Wedding Plastic Silverware (assorted, with double forks), $22.99 with free Prime shipping. 14 cents per piece. 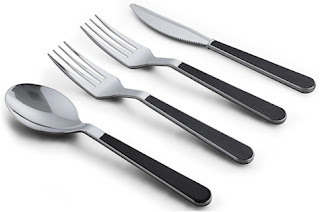 Occasions 160-piece Black and Silver Wedding Plastic Silverware (assorted, with double forks), $19.90 with free shipping. 12 cents per piece. 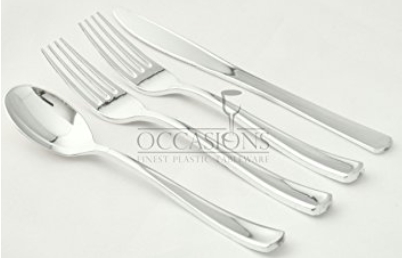 Occasions 160-piece White and Silver Wedding Plastic Silverware (assorted, with double forks), $19.90 with free shipping. 14 cents per piece. 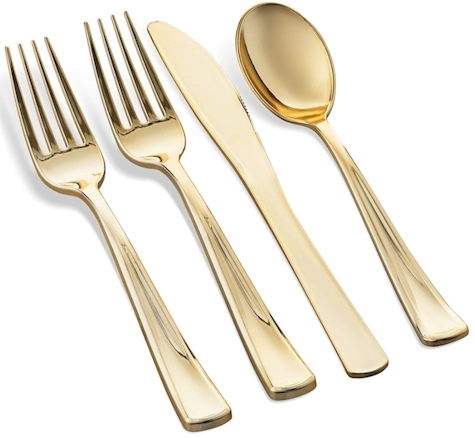 Occasions 160-piece Gold Coated Heavyweight Wedding Plastic Silverware (assorted, with double forks), $22.99 with free Prime shipping. 12 cents per piece. 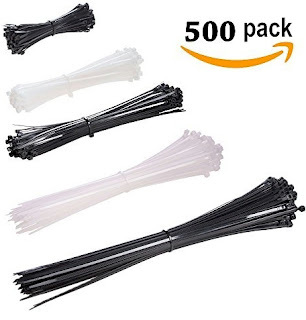 This is not an Amazon deal, but worth looking at. I ordered this last year and I was very impressed with the quality. 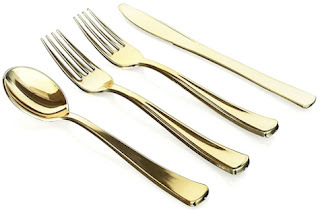 Target has got this 60-count Spitz Gold Cutlery for $5.00. 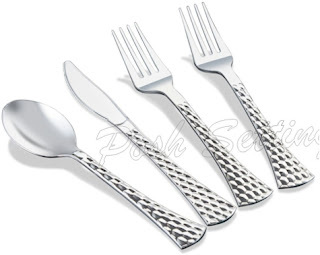 You can also get the 60-count Spitz Silver Cutlery for $5.00 as well. 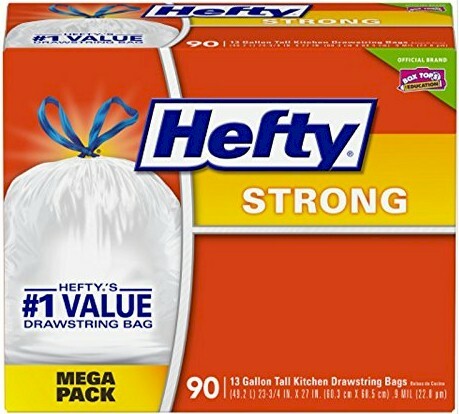 8 cents per piece. If you've got a Target RedCard (and if you don't, you really need to get one because RedCards are awesome money savers), you will save 5% on these sets, bringing the price down to $4.75. Shipping is free with either a $35 minimum order, or with using your RedCard as your payment method (no minimum), or it's $5.99 flat-rate shipping. You can also opt for free in-store pickup.